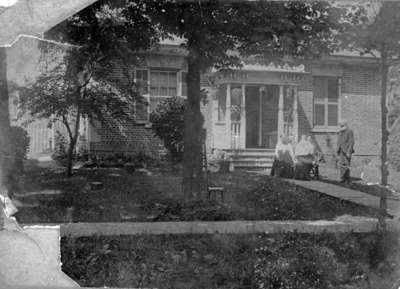 A black and white photograph of the residence of William Bryan with people sitting and standing outside. In front of the house are Mrs. William Bryan, unidentified woman holding a baby, William Bryan. This Regency Cottage was built in the 1850s. This house is located at 206 Byron Street North.